We’d love your help. Let us know what’s wrong with this preview of The Aztecs by Richard F. Townsend. A portrait of a fascinating, complex civilization. Beginning with the story of the Spanish conquest, the text then charts the rise of the Aztecs from humble nomads to empire builders. Within 100 years they established the largest empire in Mesoamerican history and, at Tenochtitlan, built a vast city in a lake, a Venice of the New World. This revised edition has been updated, assimilating information from archaeological excavations and ethnohistoric studies, and widening the picture of Aztec culture beyond their cities. Additional material on topics ranging from local crafts, trade, agriculture and food to architecture, society and women's roles depicts the richness of life in villages and regional centres. Illustrations of archaeological sites, pictorial manuscripts and monuments enhance the narrative. To ask other readers questions about The Aztecs, please sign up. I have been fascinated with the Aztecs on and off since childhood, when I first saw a photo of a statue of Coatlicue in a mythology encyclopaedia. I was horrified, frightened and utterly, utterly in love. Funnily enough that photo is in this book too. Even though it’s a textbook it isn’t overly scholarly, and is quite readable (it just took me a while). 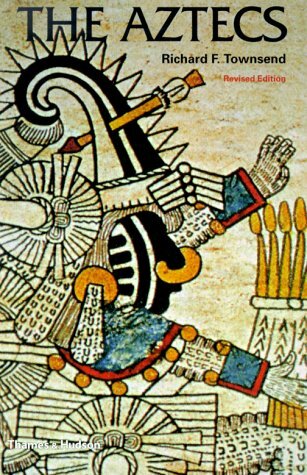 However, due to the structure of the book I wouldn’t recommend it for someone who doesn’t have a little bit of knowledge on the subject already; I have been fascinated with the Aztecs on and off since childhood, when I first saw a photo of a statue of Coatlicue in a mythology encyclopaedia. I was horrified, frightened and utterly, utterly in love. Funnily enough that photo is in this book too. Even though it’s a textbook it isn’t overly scholarly, and is quite readable (it just took me a while). However, due to the structure of the book I wouldn’t recommend it for someone who doesn’t have a little bit of knowledge on the subject already; it starts with Cortez and their destruction, then goes back to trace their roots through the early tribes, through to how they maintained an empire-like social structure – and only the final two chapters talk about their religion and the day-to-day lives of the people. Even then, the focus is more on physical history than social; the chapter on religion does give an overview of their different deities, but it’s very brief and prefers to focus on the calendar system and ritual sites rather than give any deeper insight into their actual mythology (except for briefly outlining their creation myth and Huitzilopochtli’s ‘main’ myth as a backdrop for explaining features of the sites and the Mexica’s early tribal history). It could be that there is some confusion over it, because everything I read seems to give different accounts e.g the creator is either a male and female god or one god that is both, sometimes Tezcatlipoca is a trickstery god of fate and sorcery, sometimes a reasonably benevolent but prone to whims god of fate and the wealthy and slaves...Maybe he just wasn’t that bothered about addressing it; he puts forward a belief that the human sacrifice was as much a political move to inure citizens to bloodshed and create fear in enemies as to do with the central religious belief of sacrifice to keep the gods and the world going – if not more so. I’m not sure how I feel about that. Anyway, I feel that the structure and focus of the book might put people off unless they already have a vested interest in the subject. I find the Horrible Histories books can be a good primer even for adults, as the silly humour can help soften a serious subject – and it presents the information as bite size chunks which are easier to remember. Townsend and smith disagree on some point, but then this is still a growing subject and you can kind of expect that. After reading The Aztecs: A Very Short Introduction I was interested in reading a bit more on the topic and this book was conveniently available at my library. It took me a bit of time to get around to reading it, but it proved to be quite readable and informative. I especially liked a map of the Valley of Mexico that I referred back to repeatedly while reading the history of the empire to get a better sense of how things related to each other. I just wish that some of the broader focus maps had After reading The Aztecs: A Very Short Introduction I was interested in reading a bit more on the topic and this book was conveniently available at my library. It took me a bit of time to get around to reading it, but it proved to be quite readable and informative. I especially liked a map of the Valley of Mexico that I referred back to repeatedly while reading the history of the empire to get a better sense of how things related to each other. I just wish that some of the broader focus maps had as much detail since they sometimes don't include sites referenced in the text. The map also helped me to finally understand the "Triple Alliance". I think most maps I've seen just have a dense cluster of dots for Techontitlan, Tetzcoco, and Tlacopan on a zoomed out image of the region. Seeing a bit more of the geography and just how spread out these three city-states were helped emphasize that they were distinct polities. I do wonder why the two books on Aztec history I've read feel a need to start with the Spanish invasion. Would a history of the Persian Empire start with the conquest by Alexander of Macedon? It feels a bit insulting, like it is framing the history with its inevitable collapse. It does allow the description from then on to concentrate mainly on the pre-Columbian history and society, but conversely it also severs the Aztec narrative at the point of invasion. The Very Short Introduction did talk about continuity of culture into the modern period, but I find myself thinking that a more complete history should include more about the colonial period and developments then. This review has been hidden because it contains spoilers. To view it, click here. This was a very insightful and interesting book about the Aztecs early and late history. It talks about heir religion, their military, and the other aspects that make up the Aztec culture. I would recommend this book to those who are interested in the Age of Discovery, Central American cultures, and the Spanish Conquistadors. Very informative and a good research tool with Ross Hassig's work. The two complement each other, with this work filling out the social side particularly well. In this history of the Aztec much is discussed regarding their culture and customs. Photographs of artifacts are included in the work. This is an interesting read on of one of the Native American groups of present day Mexico. An incredible, easy to read insight into one of the world's most intriguing civilizations. This generous, glossy book is an incredibly detailed historical account of the Aztec civilization, from its mythologized beginnings to its exceptionally bloody end. Stories of gods, heroes, and the native peoples of Mexico's way of life will delight readers, even those with copious knowledge of the civilization. Illustrations paint a picture of the highly scientific and religiously motivated civilization, a An incredible, easy to read insight into one of the world's most intriguing civilizations. Stories of gods, heroes, and the native peoples of Mexico's way of life will delight readers, even those with copious knowledge of the civilization. Illustrations paint a picture of the highly scientific and religiously motivated civilization, as well as their inability to make friends with neighboring regions. Conquistadors may have distorted some of the more in depth aspects of traditional Aztec life, but we are lucky to have the codices we do that offer readers a primary source document for mythology and devotions of native Mexicans. The author delves into philosophical aspects of the peoples of Mexico, what they could have been, and where they were going before the arrival of the Spanish armada. Readers know the story of 300 some odd men taking over an entire civilization, but they may not realize that other native Mexicans were goaded into helping defeat their neighbors, and then subjugated by their captors. The Aztec tale is one of early Mexico itself, a country of many civilizations, one being supreme, but not enough to save it during its darkest hour. Was given to me by someone who had taken a course on Aztec society. Since I had very little knowledge on the subject, I decided to give the book a chance. It explains the rise and fall of a great civilization, taken over by Hernan Cortes and the Spanish. It is a good book to read before diving into heavier, more specific texts on the subject. Keep in mind this is a text book. Do not expect to say it is something that you cannot put down. It does give great information on subjects like Aztec relig Was given to me by someone who had taken a course on Aztec society. Since I had very little knowledge on the subject, I decided to give the book a chance. It explains the rise and fall of a great civilization, taken over by Hernan Cortes and the Spanish. It is a good book to read before diving into heavier, more specific texts on the subject. Keep in mind this is a text book. Do not expect to say it is something that you cannot put down. It does give great information on subjects like Aztec religious beliefs and the building and expansion of an empire. It has great illustrations, such as codices, which I had to be taught how to read correctly. A solid overview of Aztec culture and, to a lesser extent, history. It's not really an academic work, but rather reads like a "greatest hits" of scholarly works that can give a regular reader a decent grounding in the subjects (as well as a bibliography for further reading). Given that it's largely an overview, there are a lot of subjects where the depth isn't great, but it's a short, very readable book that's enjoyable to read. Another textbook about Aztec history. Unlike some, most of this is organized thematically rather than by narrative. Solid, but some parts, like the ones about the Conquest, tend more toward sensationalism than helpful and show signs of not having been revised recently. A very good overview of Aztec history and culture. Another comprehensive overview of Aztec history, though again with a Mexican bias. Focuses more on the "imperial project" than the Smith book. Good, yet it didn't keep my attention. Very thorough, unbiased, in-depth. Review forthcoming. It's not a bad book by any means. It has a lot of good information. However, it's on the dry side, especially compared to Smith's book on the Aztecs. This is an exquisite volume dedicated to a thorough introduction to the Aztec world and mind. A must fro students of Mesoamerican cultures.